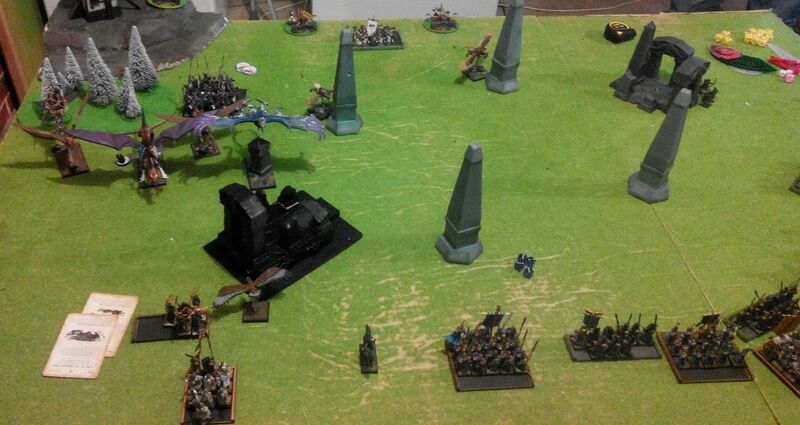 Very fast army with no less than 4 fliers and even the small skycutter can take on my small units on its own. Backed up by very good shooting and decent heavy cavalry that army seems to have no weaknesses for my force. Let's go through that list in more details. Prince on Star Dragon - the most expensive model on the battle field but also the most powerful one. Regular dragon is a trouble, this is even worse. Whatever unit he attacks is dead simply because there are so many attacks, backed up by thunder stomp. He will want to be in combat from turn 2 so I need to do everything to slow it down. First, challenges will be helpful in that regard. As usual against large flying monsters I need to be careful with potential overrun/pursuit paths so that there is no chain reaction of charges. Second, while tough it is still vulnerable to magic missiles (in particular the Prince) and even bow fire can get a wound here and there. While desperate measure it may help to make it nervous about incoming combats and the good thing is that my units may attack before Star Dragon so they will have a chance to wound it too. Finally, Searing Doom and Bolt Thrower are my best bets against it. If all together is combined I have a chance to take it out in the course of the game. So the idea is to keep it away from combat as long as possible and use the opportunities to take away the wounds. BSB on Griffon - much more fragile than Star Dragon, it still hits powerfully. 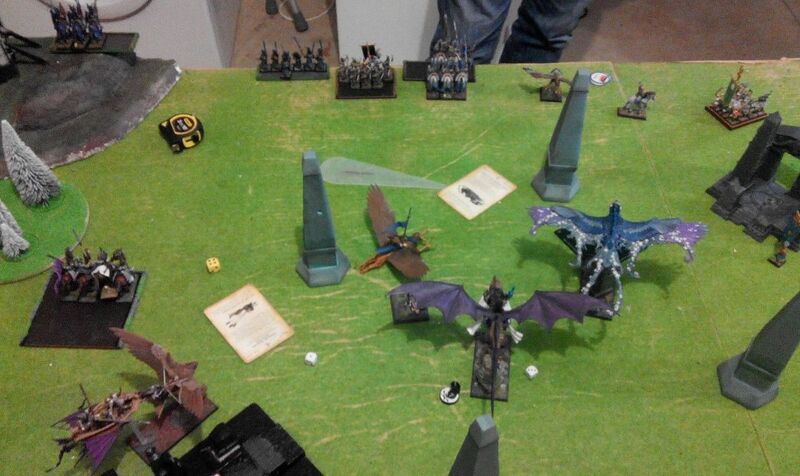 3 attacks with star lance and ASF for griffon (who gets devastating charge and +1S on the charge too!) is a very good combination. Not to mention thunder stomps. 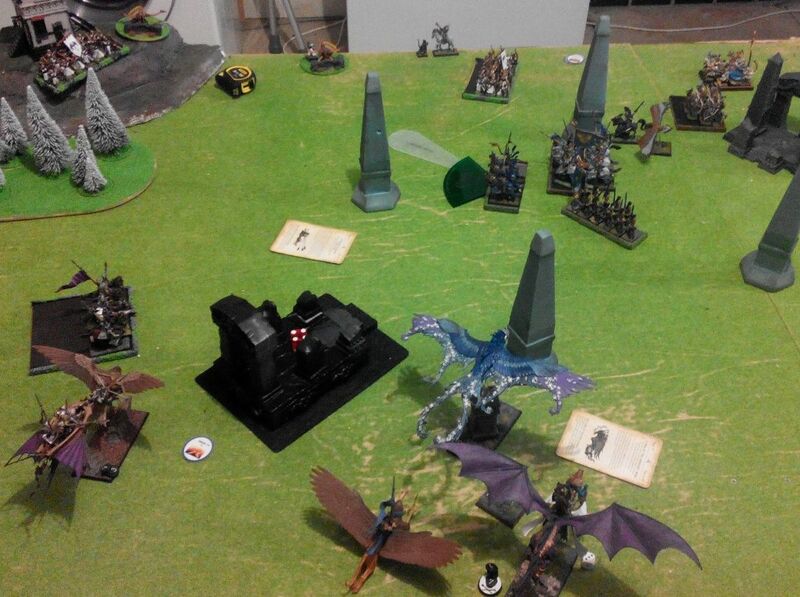 So against Swordmasters or Lions BSB and his Griffon will strike before my warriors, with all the re-rolls they need. I am afraid there will be not much left to strike back and they will be soon finished by t-stomps. Griffon has no armor, however, so I will try to exploit that weakness. In fact, I would try to hunt it down with bows, bolt thrower or magic first as it is easier to wound. If I can make BSB a pedestrian he will be more vulnerable and will not be able to support the Prince. It is very important because if they attack together then even with the challenge I might not have enough bodies left to remain steadfast. Mage - Heavens magic is actually very good against MSU as I had a chance to experience a few times. Fortunately, this is not level 4 so there is a smaller chance to have a comet and a chain lightning in the same magic phase. Ring of Fury is a very good addition and mobile mage will be further adding to the potential damage done by other range attacks. Archers - 2 units of 18 makes for a good support for sure. Large enough to fight off light troops of the enemy can assure that the big fliers can do their job and don't worry about the rear guard. They are also numerous on their own to inflict some casualties before the enemy is hit by assault teams. Banners add to the Blood and Glory scenario and while we didn't play one I mention that because this is the basis for 3000 point army Darth is going to use in a tournament. Silver Helms - their main role is to provide shelter for the mage and keep up the pace with the fliers for the purpose of augments and hexes. But they are also a decent unit on their own and can help clearing unit that may somehow escape the attention of the heavy hitters. Skycutter - definitely not a popular choice but fits into the theme and may fly under the radar (literally) due to bigger threats. It may further add to the impressive damage potential with its impact hits although has to be used with care as it is the most fragile unit. Again, may be as well used for the guarding duties and support silver helms. 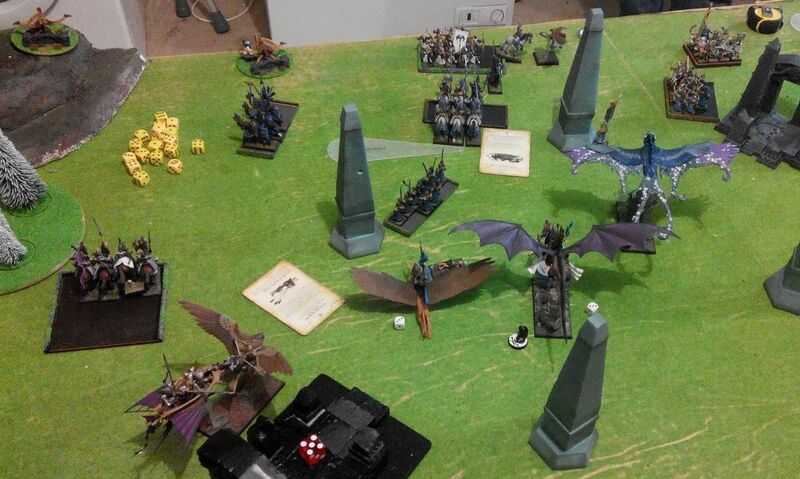 Frostheart - addition of the third flying monster looks like overkill for this game. Frost aura may not be that useful against my units but it is a very good support monster for sure. Against small units it can comfortably charge and tie up some regiments to help Star Dragon and BSB to catch their prey. 3 Bolt throwers - always dangerous and the more the better for my opponent. In the case of this army they also fit nicely because the speed of the fliers can assure they will have clear line of sight to many targets. And combination of highly maneuverable, hard hitting characters that would force me to move fast too and bolt throwers (that will threaten with single bolt flank shots) is simply deadly. The news were grave indeed. Restless dead were seen in places they have never been encountered before. Disturbing news about the death of the great Elven heroes circulated among the warriors like wildfire. Rumors about End Times were openly discussed as it was always customary for the Outcasts. Larry, Bob and Nasher studied the maps intensely as if staring at the same charts they knew by heart would bring more information and maybe even some answers. A pile of open letters on the nearby table revealed seals that belonged to Asur, some to Asrai and even a few to Druchii. "I can't believe it can happen even in a dream" - said Nasher without breaking the study of yet another scroll - "Grand unification? I don't think Aenarion himself could do it now, after thousands of years of constant civil war"
"It has already happened once" - Larry pointed out while picking up a new letter from the messenger. "You cannot compare the few individuals who joined our ranks to whole nations!" - the knight protested firmly. "Why not? It takes a pebble to start an avalanche after all." - replied the Loremaster with a hint of a smile. - "In any case, we need to make sure Ulthuan stands united and the recent rumors about Imrik worry me a lot. They need a common cause to join forces even if they can't stand each other"
"I don't understand how the danger of Daemonic invasion is not enough" - murmured Nasher - "How are we going to do that alone? Do we have any friends on Ulthuan to rely upon?" "You know very well we have no friends there" - Bob cut in - "Besides, Outcasts always fought alone"
"Nothing is better to unite the nation than the enemy that comes from their own ranks" - added Larry - "so we need to strike here"
Nasher looked at the map and blinked. Then looked at Larry, then at Bob, as if looking for some trace of a joke. He found none. Both were dead serious. "Caledor? You want to strike at Caledor?" "Yes, Caledor. Don't worry, boy, as long as you remember that any Elf in red or green is not your friend, you will be just fine" - chuckled Bob. "But how do you plan to win against Dragons with such a small force at your disposal?" "We will try to win as always but the main purpose is to hurt something Caledorians treasure the most, so that they cannot ignore us" - added Larry, gesturing to another messenger and giving the last orders - "Their pride"
Prince Serien sat astride the mighty Star Dragon Seryn and surveyed the battle field. He turned to Turin, his friend and trusted standard bearer "This is what they send against the might of Caledor? Are they serious? A bunch of outcasts from the mountains of Chrace, cast offs from the White Tower and expelled Caledorians that should be ashamed off themselves"
Turin sat astride the mighty Griffon Stormclaw and agreed. "My friend these are dark times, maybe the End of Times, how else can you explain elves attacking elves. Caledor and Aenerion would be shocked. However we must do what we must? These outcasts need to be taught a lesson and shown the full might of Caledor. Onwards my friend, let's cast aside these pheasants and await the storm that is clearly coming from the Realm of a Chaos"
With distain Serien nodded and urged Seryn to the sky "attack - show no mercy"
And with that the might of Caledor descended upon the rag tag band of outcasts. Armies deployed in both corners. In the background a chaos portal, fortunately, not active yet! It was a symmetric terrain, with 3 stories towers in both corners and impassable terrain in the form of ruins and pillars. It was enough to see enemy units more often than not but it proved during the course of the battle that even the pillars can be significant obstacles. Larry joined Sea Guard to be able to cast spells turn 1 and Bob led nearby Swordmasters. He also won the roll off and his was the first turn! Without further delay, the Prince leads his warriors to the battle, atop his powerful Star Dragon. He intends to have a warm up and kill a few stragglers on the Western flank. All his warriors maintain perfect formation. 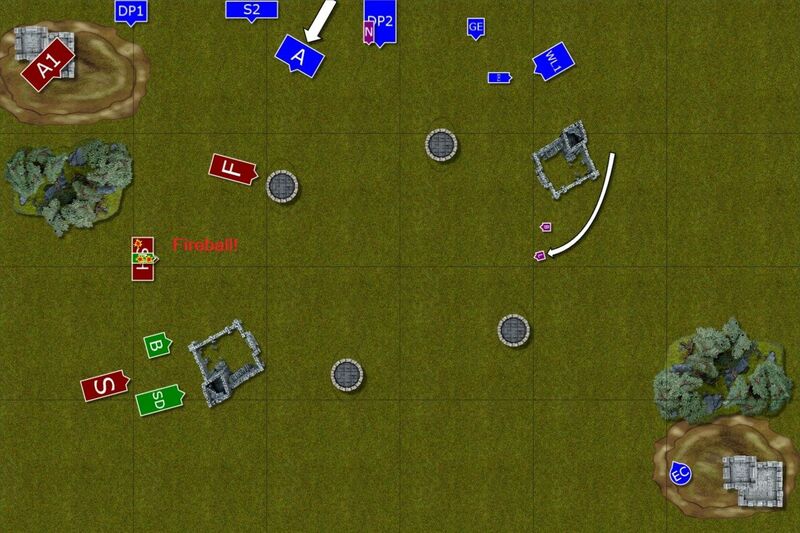 At the same time, the shooter follow the orders and begin thinning down enemy ranks. Ellyrian Reavers paid the price for being too exposed and a lonely survivor barely holds the line and even that after the encouragements from the nearby BSB. 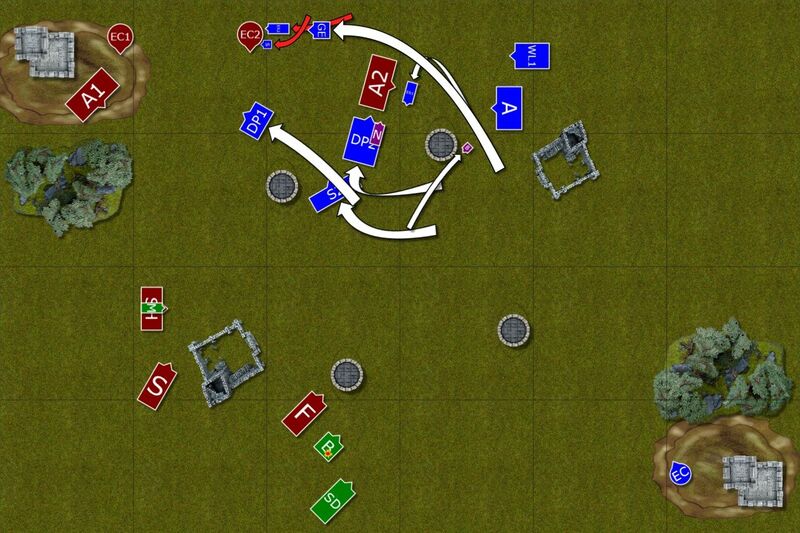 Outcasts move towards the fire base of the enemy but at the same time maintain formation that would allow to attack if the Caledorian Prince decided to change the direction of his assault. 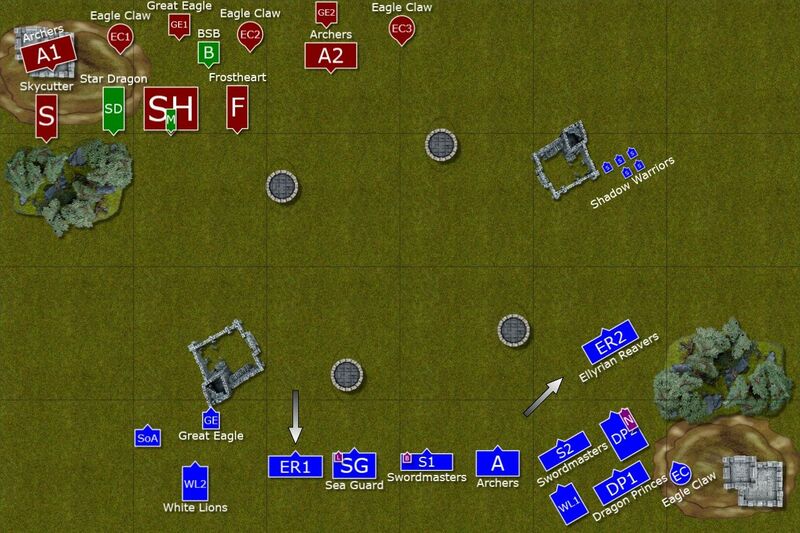 Double line protected the units behind and limited shooting was directed at the great eagle. 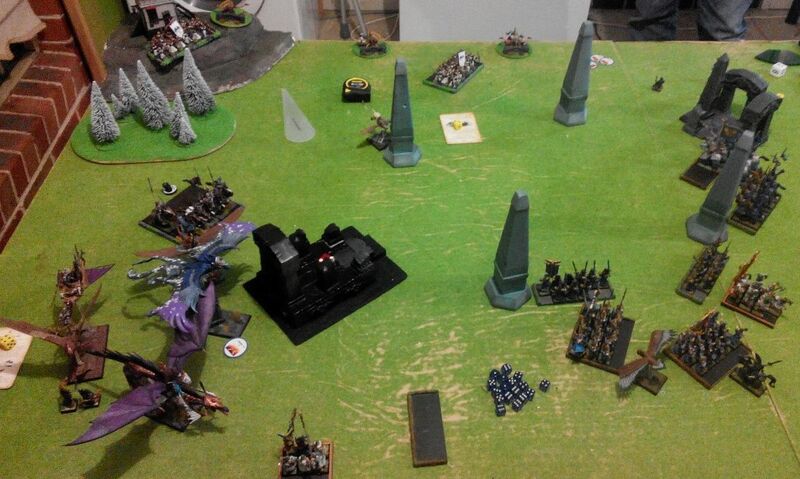 Only Eagle Claw crew had more freedom in choosing the target and they spotted exposed flank of caledorian knights. Single bolt sailed through the air and knocked down 3 proud warriors! 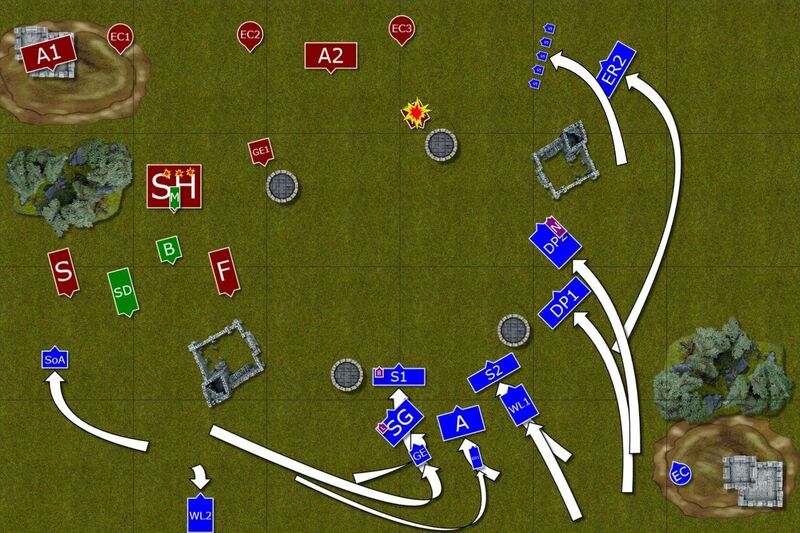 Caledorians stick to the plan and attack first enemy units. Sisters hold the line briefly but are forced to flee from the Skycutter attack. This time they managed to run away. Nearby Lions hold fast against the dragon flames but 4 of them die in the process. On the Eastern flank Archers aim at shadow warriors but they are not that accurate. 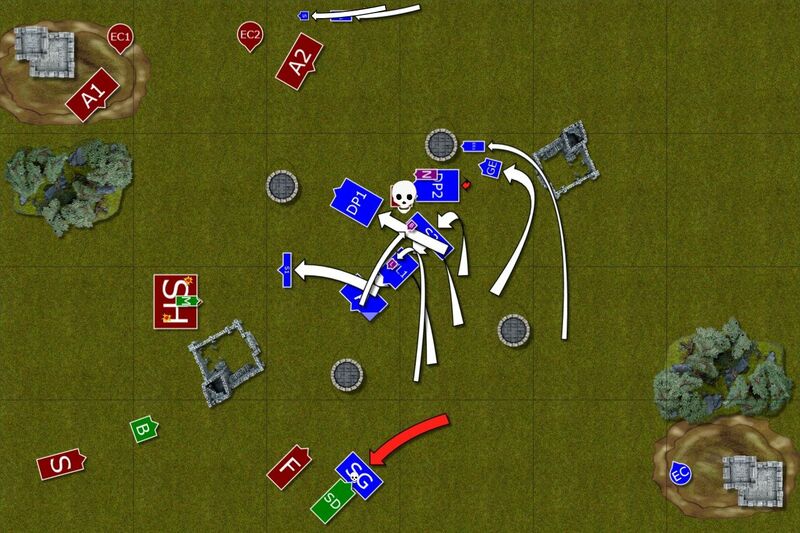 Even bolt throwers do not finish them off but nearby reavers suffer casualties as well. 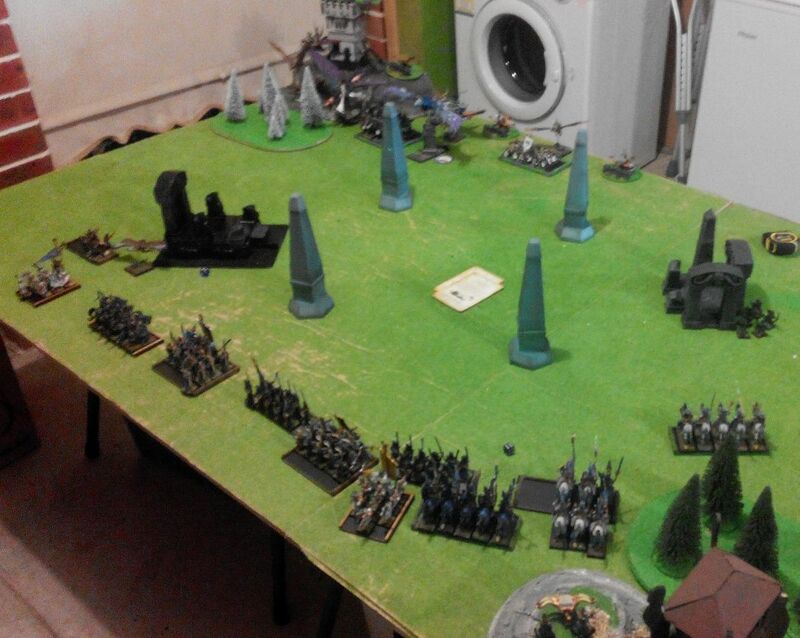 Still, single warriors from both units remain and they are ready to avenge fallen companions. Outcasts keep moving so that majority of the regiments are out of sight of the flying death. Every second that delays seeming inevitable combat counts. 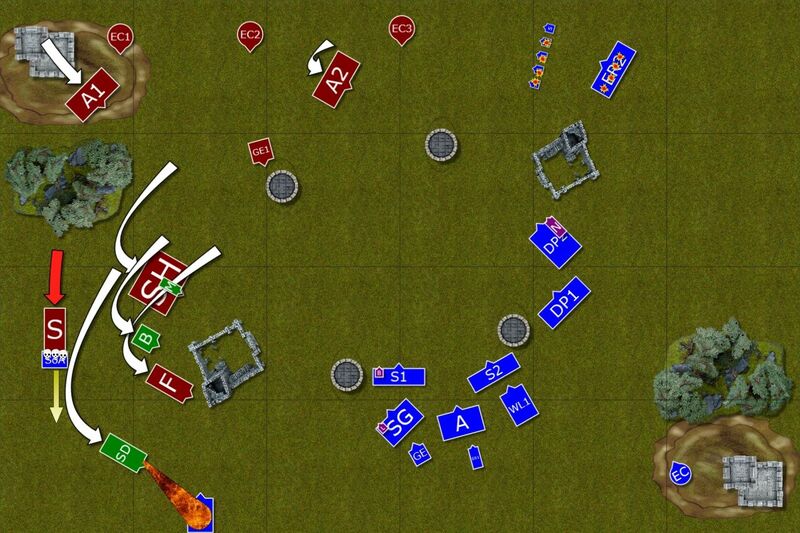 At the same time they need to advance towards the weaker shooters and try to wither the incoming fire. 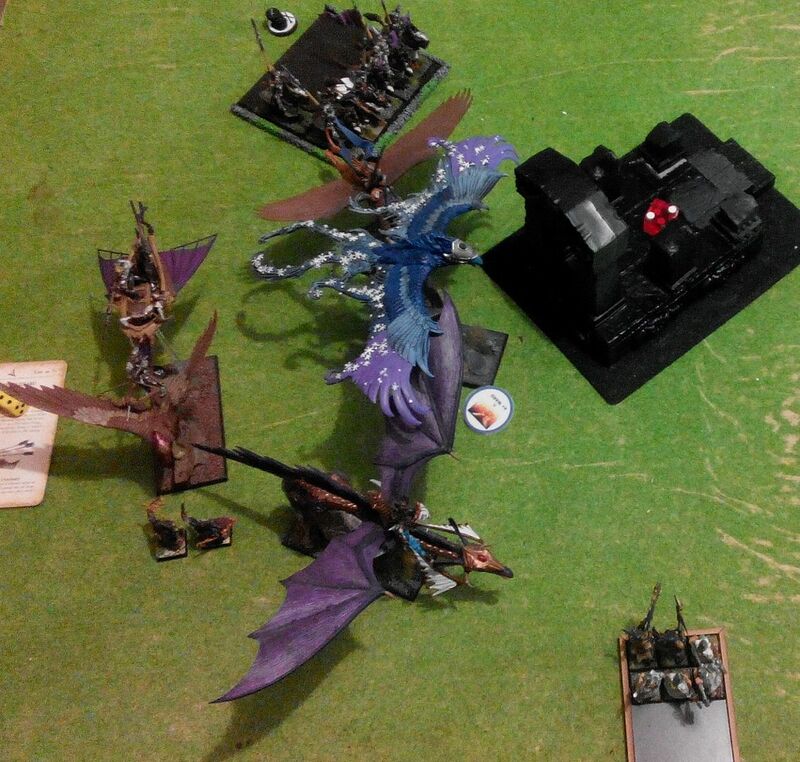 Shadow Warrior and Ellyrian Reaver attack enemy bolt thrower and chase down its crew. One down, two to go! Unfortunately, this time their own Eagle Claw misses the target and Larry the Loremaster loses focus while casting a spell. Skycutter and BSB finish their chosen targets. Sisters tried to escape and draw the flying chariot away from the main force but they were caught before could go away (Edit: I fled but rolled double 1 for flee distance). Lions died to an elf before any of them could strike a blow. This time it was for the Swordmasters to be the main target of the enemy shooting. More than half of the unit perished but it was still less than Caledorians expected as the warriors of Hoeth deflected many bolts and arrows with their great swords. 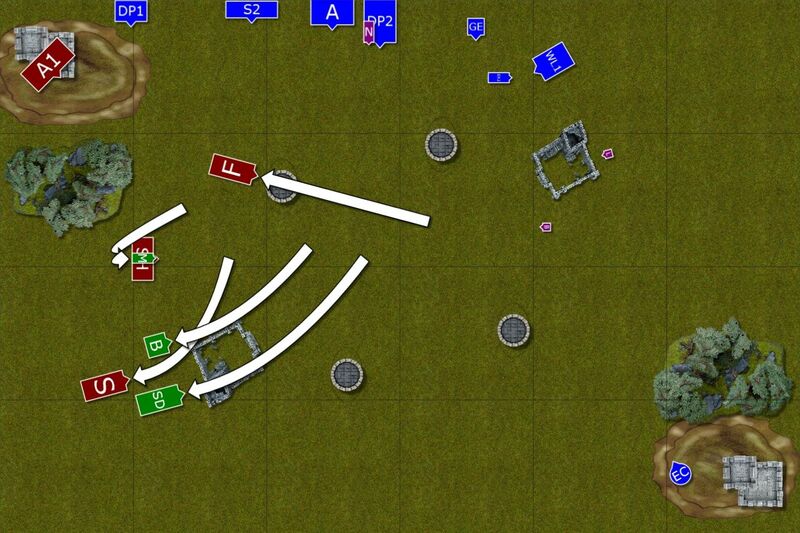 Enemy eagle slowed down the advance of the cavalry. One squadron hunted it down while the other maneuvered around. 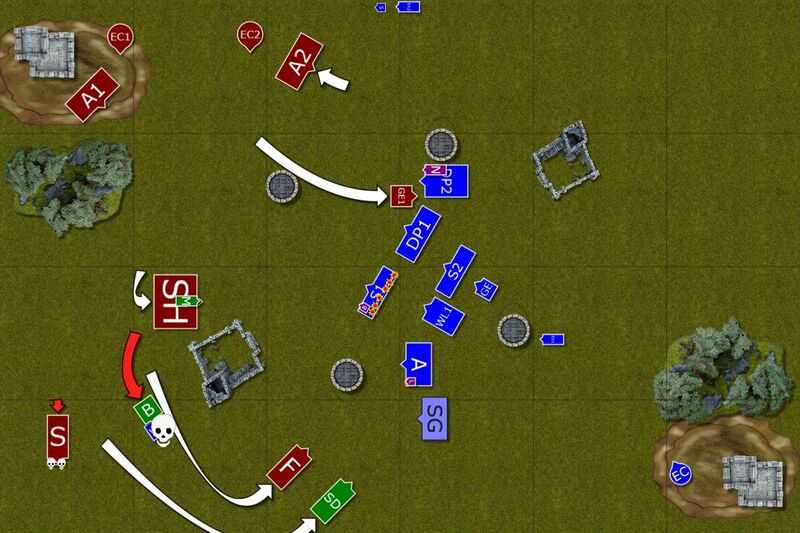 Larry and Bob hopped between the regiments to keep the formation solid and not be exposed in case of the attack. 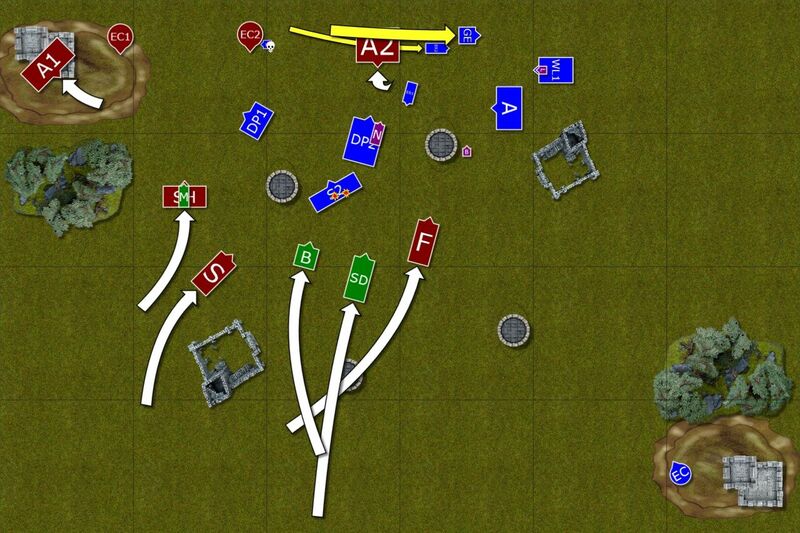 Outcasts formed a triple line to prevent enemy from attacking units behind the Archers, thus forcing the foe to limit their potential targets. Larry the Loremaster managed to sneak through Shems Burning Gaze that cost life of two more Caledorian knights. Now their mage was dangerously exposed. Eagle Claw crew was again unsuccessful (Edit: Although this time they failed to wound the Griffon, I think). 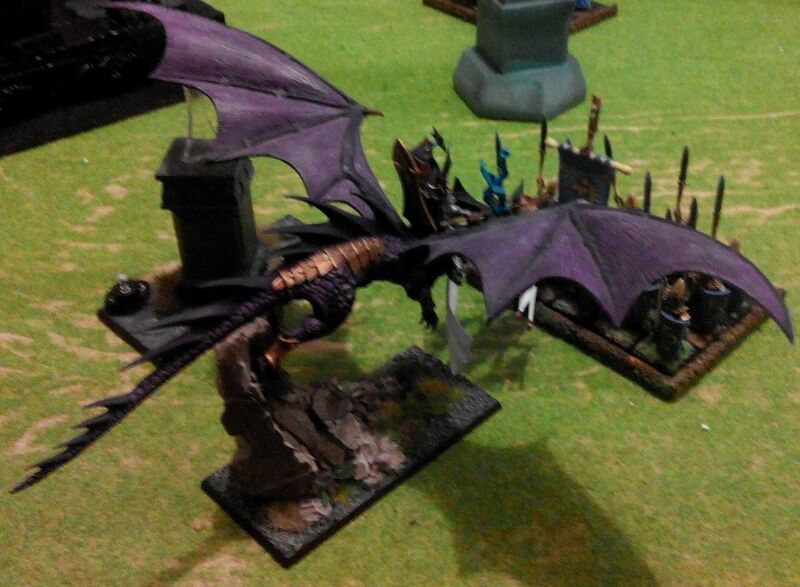 BSB swoops down to aid his Prince. He knows he does not need any help but it is a matter of getting back to the main enemy forces. Between the many attacks of both Caledorian leaders and their powerful mounts, not a single elven marine is left alive. 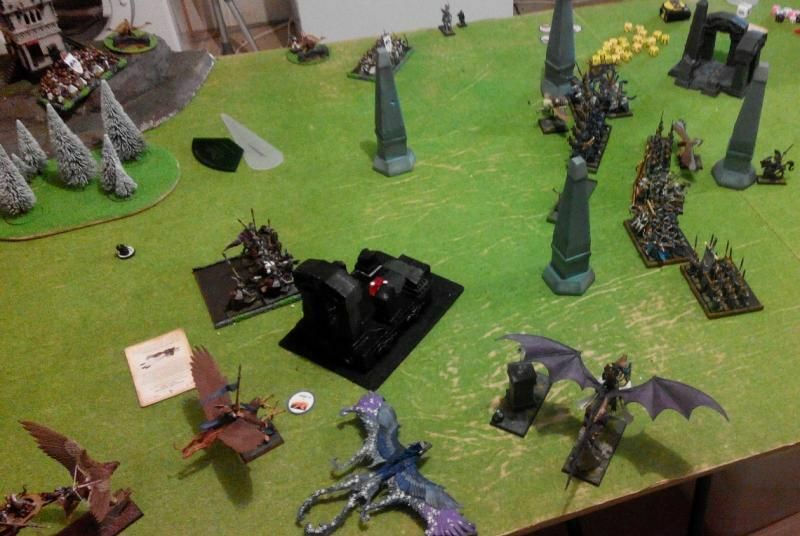 Frostheart phoenix is ordered to charge nearby troops in order to tie them in combat but Archers and then Lions with the Loremaster withdraw. Claedorian archers try to catch them as they do so but are not successful. Shooting eliminates depleted regiment of Swordmasters for good. Two Dragon Princes are also unhorsed but the single Shadow Warrior and Ellyrian Reaver are strangely ignored. 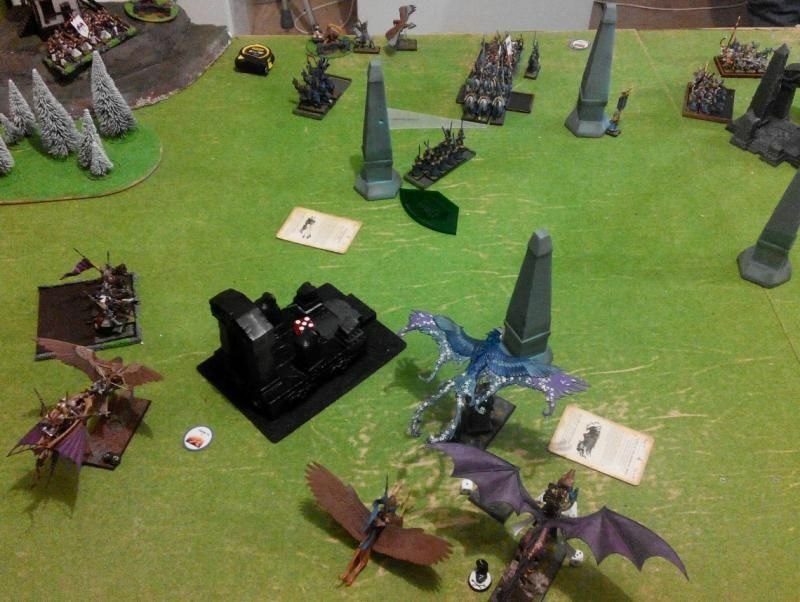 Shadow Warrior and Ellyrian Reaver team up again and attack bolt thrower but this time the crew holds. Another lone rider blocks enemy archers so that they are isolated and do not charge to break through. Yet again magic proves to be a failure. At least Eagle Claw crew hits the Griffon but wounds it only slightly. The Prince leads his warriors in another chase after the evading Outcasts. He is determined to catch them this time. The situation becomes even more complicated when Shadow Warrior dies and Ellyrian Reaver breaks from combat, panicking nearby eagle! 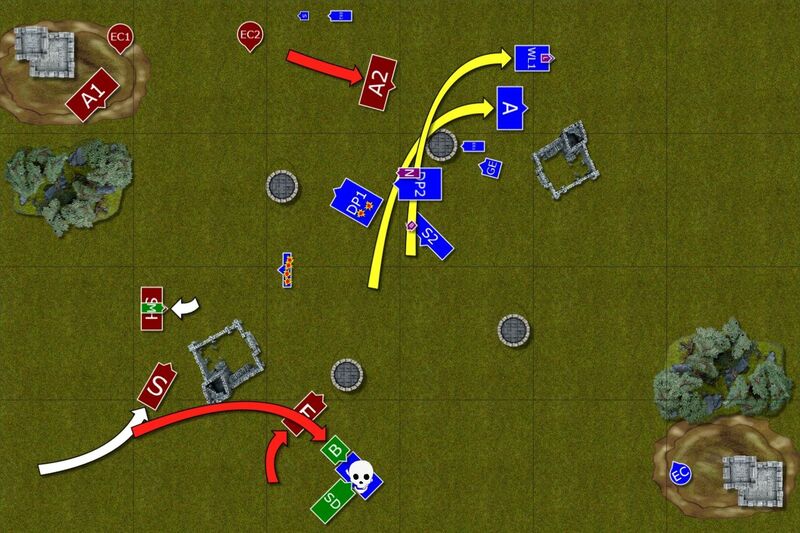 Not only they failed to destroy bolt thrower and be in position to attack the enemy but now they were blocking the flank of enemy archers to be attacked by their companions. Bolt thrower crew on the hill rejoiced when they spotted exposed flank of the enemy knights but failed to hit the target! Outcasts have only once chance now and they are determined to get the most of it! 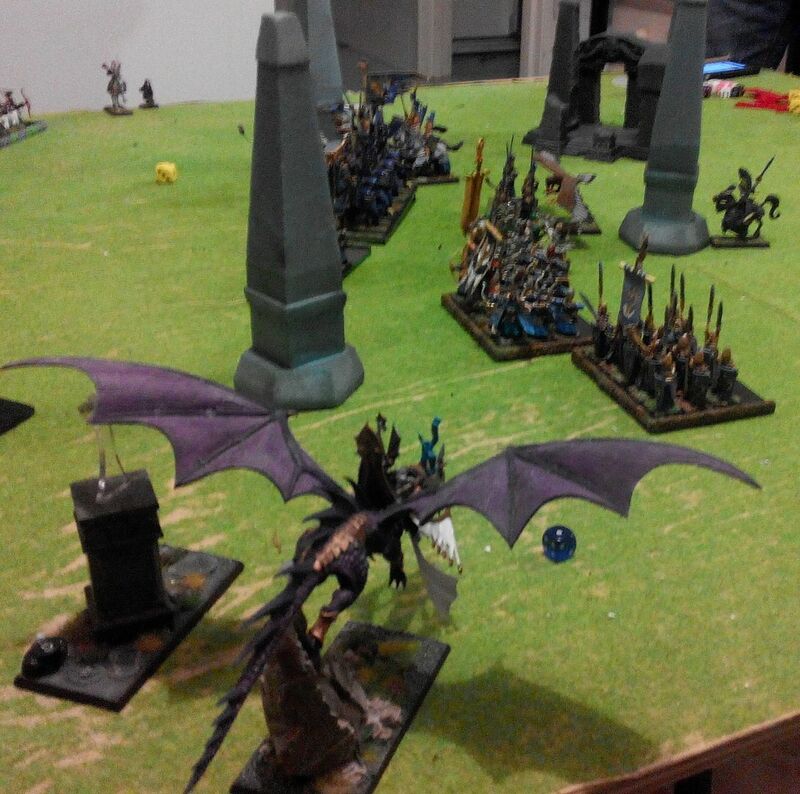 Dragon Princes attack the Western bolt thrower and overrun out of the battle field. 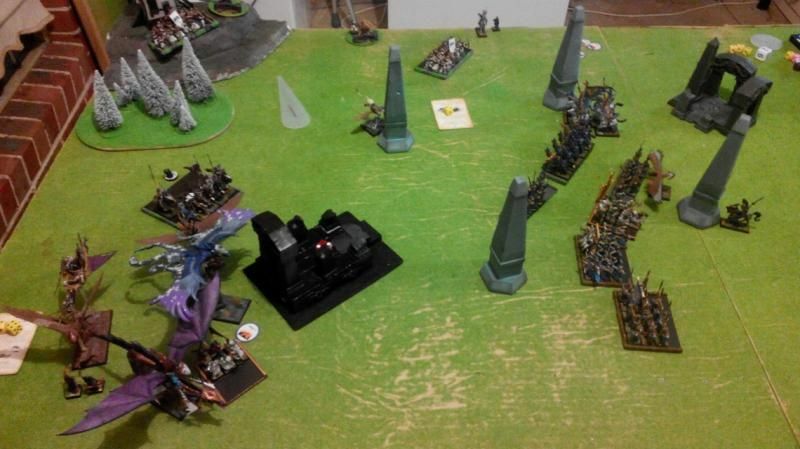 Swordmasters avenge Shadow Warrior and repeat the feat against middle war machine. 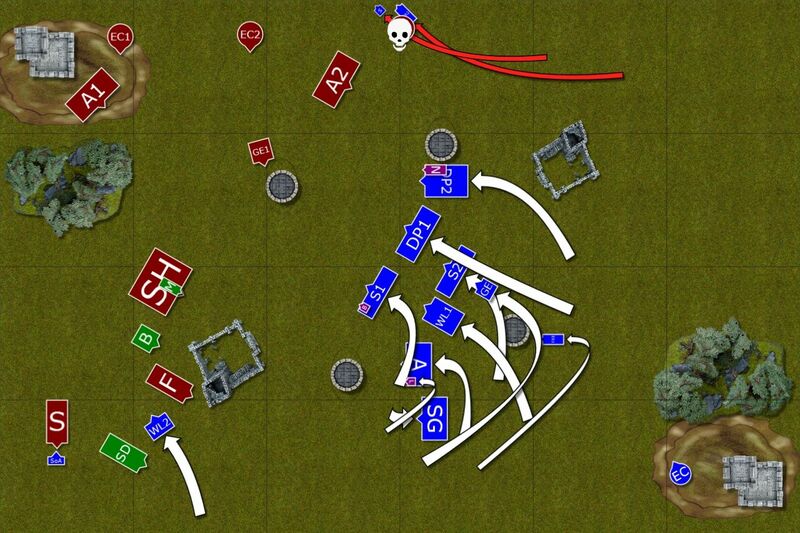 Lone Reaver charges alone against enemy BSB and dies in combat in order to open the path for the Archers. They attack enemy shooters with Dragon Princes and destroy them in pursuit that also takes them out of the battle field. It is clear that the Outcasts escaped the Prince and his fliers but it was not time for Larry and Bob to strike back. Bob used his magical ring to draw away magical power from the Caledorian mage. That allowed Larry to focus his energy into one, irresistible spell that hit Caledorian Prince and his mount. Unfortunately, the hits were not that powerful at all. (Edit: I rolled 6 dice for the boosted Searing Doom and was rewarded with IF. Although Darth used his scroll already. 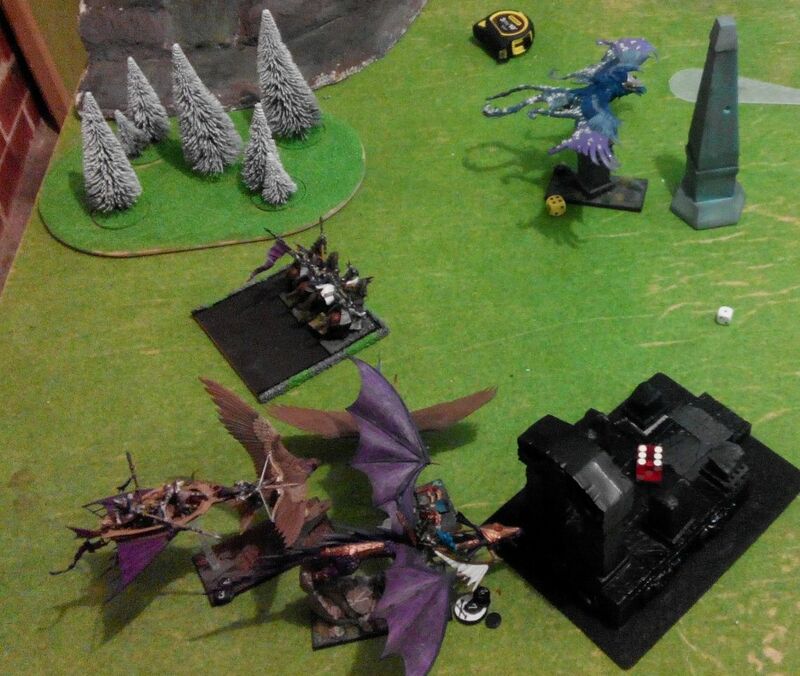 However, I got miserable double 1 for number of hits and that was evenly distributed between Prince and his Dragon). Eagle claw tried to hurt the Prince again but they missed this time. Caledorians are forced to withdraw! With no foe to attack and the danger of being magiced or shot to death, the Prince gives the order to withdraw. His warriors follow in silence, knowing their commander is in a foul mood. He was fooled by the band of outcasts and almost killed by their Loremaster! Troops coming back to the battle field could not be more happy. They avoided deadly combat with the powerful foe and forced it to withdraw in disgrace. While there was no clear winner, the fact that Outcasts were not even defeated, not to mention utterly destroyed, was a surprise to many. When we calculated the points it was revealed that Darth got more than me but not enough to claim even the slightest victory. It was a draw that was a very good result for me for sure. I am very happy that I moved with my army forward rather than waited for inevitable charge. Holding in the opposite corner has its advantages though. Since Darth deployed his shooters quite far away, I could limit the effect of that threat. Archers needed to march forward to get in range, bolt throwers were already on the long range and the pillars had actually blocked line of sight significantly. That is also the reason why I decided to move the characters alone (apart from being more vulnerable in combat or exploding in the case of a miscast) as they had a few nice spots to hide. This approach is not without risk but I choose it based on my previous experience against armies with big flying monsters. They are fast and tough but it does not mean they can be everywhere at the same time and their other regiments can be beaten too. I have learned that it is important to go blow by blow. For every unit they kill I can try to get one of theirs. This creates a situation where I earn points to balance the losses. In this particular match up the challenge is even bigger because the shooters, although fragile in combat, can inflict significant damage on their own. That is why I think it was very risky to move fast forward and try to get to those shooters while slowing down the fliers. Slowing down one big flier is not easy, doing so against 3 is obviously even tougher. It helped a little that Darth had to keep them close to each other to limit further my small amount of ranged threats. 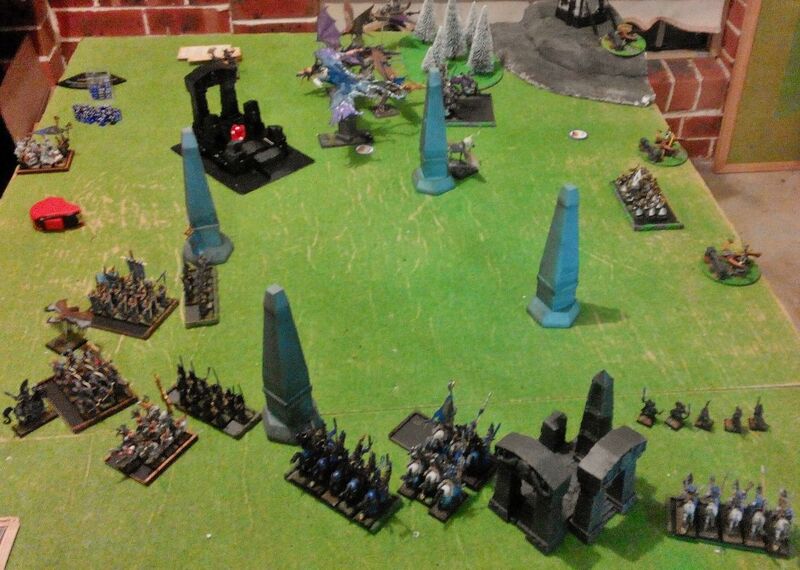 He did well by hiding them behind the terrain but at the same time he spent one turn on that flank. I don't think it is a mistake, he got two small units there after all. But that successful bait allowed me to move the rest of the army for time being in relative safety. I am glad the charge with Sea Guard worked out and I think Darth mentioned he didn't anticipate that. I was actually surprised I even won the combat as the main gamble was to charge and hold on Ld8 steadfast. If I failed, Darth would pursue and his dragon would be in a fantastic position to kill anything he wanted. I would not have been able to flee efficiently. Fortunately for me, 3+ to hit and 3+ to wound with no re-rolls was enough to kill the champion, to deny dragons attacks but not enough to overcome the static resolution I had (rank, banner, charge). I considered another option, i.e. shooting with everything and casting searing doom but decided not to. I was happy how the flee move worked into my favor. I needed to gain more space between the armies and it was the best way to teleport my units to safety. Darth had to decide what to do because he anticipated that reaction (in fact, he joked I flee way too often for his liking!). Looking at it with the full benefit of a hindsight, maybe this attack was premature? My intention was to form the units in such way that there was no space to attack the second in line, too far to guarantee the charge to third one and enough ranks for the first one to be steadfast. It guaranteed that Frostheart would stay there for 2 turns of combat. 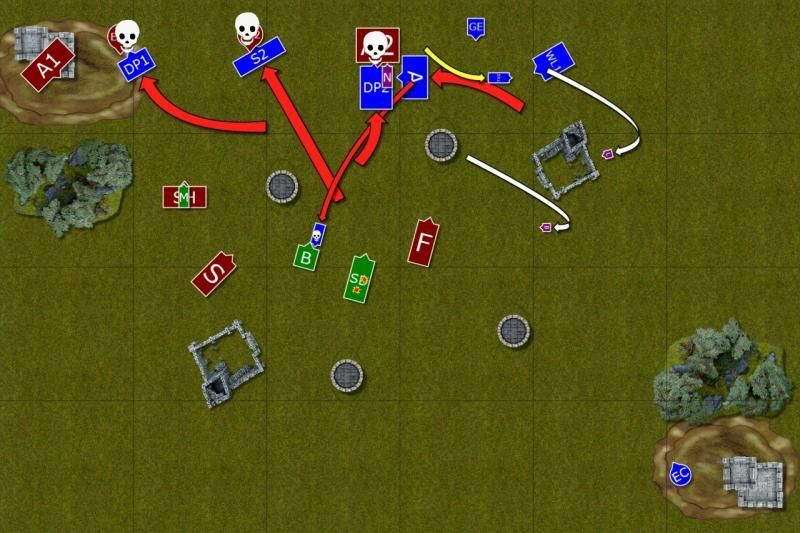 Only then I realized I can use it to double flee which was far better option because I had my units in the safety and Darths regiments in wrong spot so that he had to move again to get into charging position. The crucial was turn 5 however and I believe Darth was referring to that one in his post. The fact I made all the charges, some of them long, and moved all attacking units out of the table was what stole the last opportunity for Darth to attack with his powerful fliers. What is more, I earned quite a significant amount of points and was much closer to what Darth got by this moment. I was losing the game point wise despite the fact I kept avoiding big fights. I needed some kills to balance it out and it worked very well. 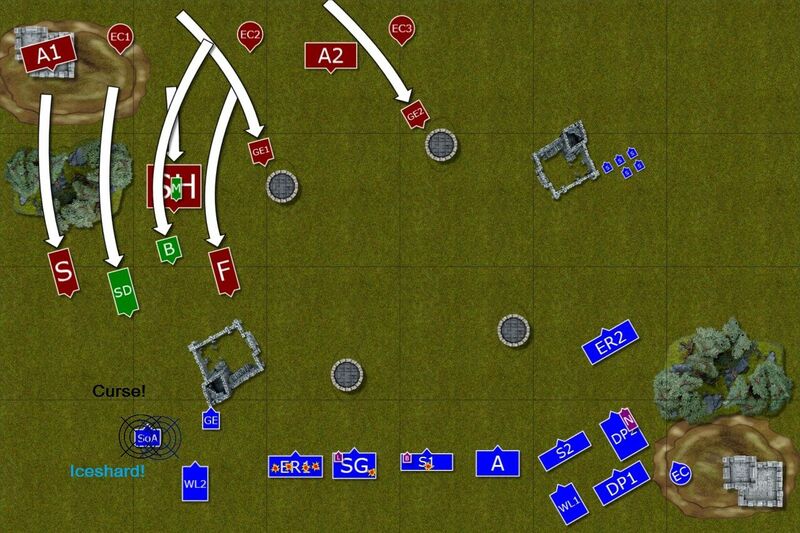 And I am glad I managed to pull it out despite failed break and panic checks that lost me Shadow Warriors and made the flank charge with Archers almost impossible. I didn't mention much about magic in this game because when playing live I don't have all the data to provide details. In general, however, I kept my dispel dice to dispel Ring of Fury and usually letting Iceshard and Curse through. Offensively, I had some low winds of magic phases at the beginning (rolling 2 and 3 for example) where I was not sure it is worth risking big searing doom yet. I failed two attempts for small searing doom on 3 dice which also ended up my magic phase. Then the big chance came in turn 5 when I had 8 dice against 5. I rolled 2 for bound spell but got 1 and 2 and Darth dispelled that with a single dice. 6 dice on bit Searing Doom this time worked out as I got triple 6 to cast. Miscast was not bad either (got 8 and wounded my own Loremaster) but rolling double 1 for number of wounds was disappointing. It was my only chance to hurt star dragon properly and didn't quite work out. The good thing, however, is that that is still an option and if I can combine searing doom, magic missiles, bolt thrower and star lance charge then I can eventually hunt the big worm down too. Easier said than done but at least there are few things I can do to threaten it. And threaten I did as Darth withdrew his fliers turn 6, as there was no reason to keep them in the open when they had no chance to charge anything. 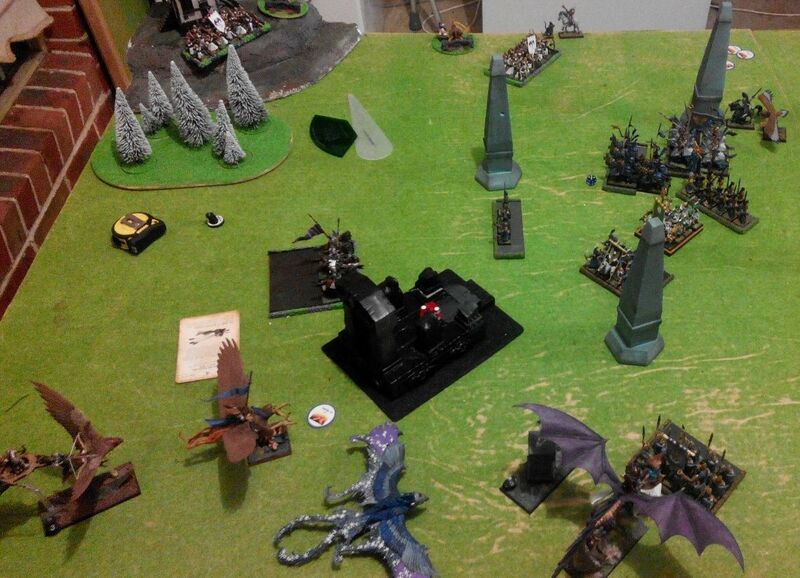 It was then up to Larry to cast last spell and it happened only big fireball has the range to Silver Helms. I didn't get the unit but 180 points extra for the level 2 was what saved the draw for me. As the result in the end was 810-735 for Darth. Once again, many thanks to Darth for his hospitality and giving me yet another opportunity to play at his place! Larry and Bob stood next to each other nearby ancient ruins. Majority of the regiments of the Outcasts were just coming back from hot pursuit and formed a new battle line. But there was no need and both Elven commanders were looking at the distant shapes of four big fliers becoming smaller and smaller. "Are you sure that will work?" - asked Bob - "we didn't win after all"
"No, we didn't but they were not victorious either" - replied Larry - "The fact that band of seemingly inferior force didn't yield and even threaten to kill their commander and his dragon will be very hard pill to swallow. They will consider that a stain on their honor and they can't let anybody know that this actually happen. They will get back and this time in real force to kill us all. They will chase us to the end of the world. And this is exactly where I want them to go. "Come, my friend" - added Larry, after a short pause - "we need to move fast"